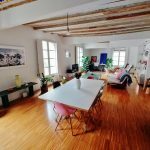 Located in El Born, next to the Santa Caterina market in a classic building with doorman and two elevators. The apartment is on the 6th floor, with lots of natural light and spectacular views of the market and the old town. The apartment has 3 double bedrooms, two interior and one exterior, all with their own large wardrobes. There is one full bathroom with shower, and one guest toilet, and an independent kitchen. The living room has large exterior windows with panoramic views, large sofa, TV and dining table for 4 persons. The apartment has air-conditioning and internet installed. 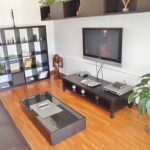 The apartment comes fully furnished and ready to enter, and is the perfect option to share between 2 or 3 friends as all the bedrooms are doubles, and the location is very central with good links to all transport connections. Hi, I'm interested in this apartment. Is it still available for viewing?